Any resemblance to Twin Peaks is purely coincidental. "There are no crickets in Wayward Pines." I nearly stopped watching this pilot a minute after it started. Why? Because the first shot was of an eye opening, followed by a pull back to an injured man in a suit lying on the ground. Seriously. Do they think we've all forgotten? Or was M. Night simply gifting us with an obvious homage? But I hung in there and watched the entire pilot, and there was enough going on that I might stay with it. Matt Dillon plays Secret Service Special Agent Ethan Burke, who goes to Wayward Pines, Idaho to investigate the disappearance of two other Secret Service agents, Bill Evans and Kate Hewson. 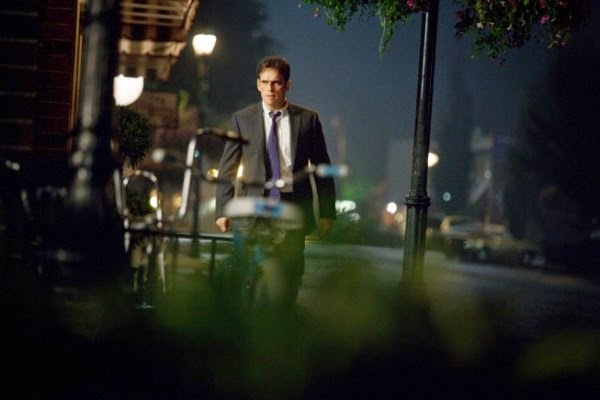 After a serious car accident, Ethan wakes up injured and on the ground (see above), walks into the town of Wayward Pines, and discovers that Something Strange Is Going On. 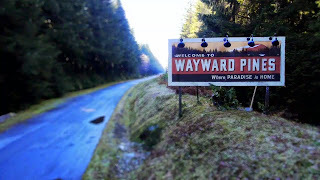 Wayward Pines the town resembles the Village in the classic television series The Prisoner, as well as Persons Unknown and specific episodes of the spy thrillers La Femme Nikita and Alias. Arnold Pope the sheriff doesn't act like a regular sheriff, plus he loves rum raisin ice cream, so law enforcement has clearly been compromised. The hospital features Nurse Pam, a jovial fiend with Nurse Ratched vibes, who threatens Ethan with no-anesthesia brain surgery. The phones are old, the décor is weird, and no one will give Ethan his wallet or his cell phone, much less a straight answer. Like I said, Something Strange is Going On. 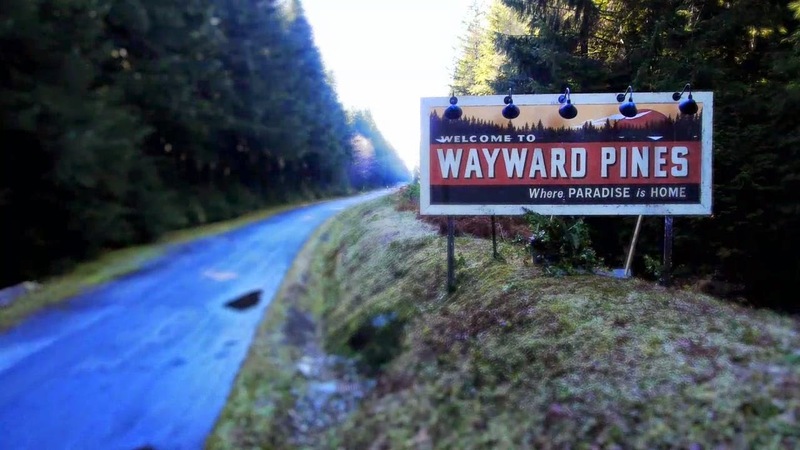 I particularly liked the Hotel California "you can never leave" bit when Ethan discovers that the road out of town simply circles around and dumps you back in Wayward Pines. Followed by the great big fence like the Great Wall of China and the sign, "Beyond this point you will die." But for me, the most interesting thing about this episode is the time element. Beverly the bartender (Juliette Lewis) is Ethan's immediate ally, giving him a great big hint about the Wrongness of Wayward Pines -- the sound of crickets is faked. Beverly knows that agent Bill Evans was horribly killed and his body is in an abandoned house. Beverly confides that she's been in Wayward Pines for a year, and that she came in 1999 to install Y2K software. That would seem ridiculous, but when Ethan finds his former partner Kate Hewson, she's twelve years older than she was when Ethan knew her only weeks ago, and she's married to a stranger (Reed Diamond). Kate tells Ethan sotto voce that they're being watched and Ethan needs to stop asking questions. Which he doesn't. This was a fairly strong pilot. I just wish it had some subtlety. The plot points and character beats are hammered into the audience as if we're not very bright and need to be led by the hand. This Town Is Wrong. How Wrong Is It? The hints that Ethan might be hallucinating because of something terrible that happened in his past might just as well have been omitted, because they go right ahead and show us that Ethan's boss back home, Adam Hassler, is conspiring with Dr. Jenkins, the Wayward Pines shrink. Plus it's hard to believe that an agent who was truly dealing with serious mental issues, including hallucinations, would be on active duty. I'll outright admit that it's the cast that is attracting me to this series, or possibly miniseries: Carla Giugino, Reed Diamond, Juliette Lewis, Shannyn Sossamon as Ethan's wife Theresa. It is not M. Night Shyamalan, who could have interpreted this pilot with less of a heavy hand. Where's the storyteller who made The Sixth Sense so unusual and compelling? Sigh. — I really liked the credits that showed toys in a model town. — Was the woman behind the desk at the Sheriff's department deliberately doing Lily Tomlin's Ernestine the phone operator? I was expecting her to start saying "One ringy dingy, two ringy dingies…"
— A couple of other weird moments were when Beverly told Ethan, "I always believed you," as if they'd done all this before. And when the bartender said into the walkie, in reference to Ethan, "10-16-28 is not doing well." — Wayward Pines is based on a series of three books by Blake Crouch. If you haven't read them, comments on this review will be free of book spoilers. If you've read the book series and want to include book spoilers in your comment, please post it on the Wayward Pines book series spoiler thread. While I liked this pilot, I got the feeling that it might be too thick for some people to get into. And that is even with the lack of subtly you mentioned. Perhaps it'll be a hit, and I hope it does well. But at the very least I would like this season to answer some questions. I wasn't sure about Matt Dillon as the lead, he isn't the greatest actor in the world. But I thought he did okay, even with his one expression. The plot, and the mysteries are the most important part of this kind of series, and the set up left me with a lot of questions. I'm looking forward to finding out if the show will follow through with answers. One last note, I read somewhere that the series will diverge from the books quite a bit, and while the books are good to get the gist of the overall story, they won't necessarily serve as direct spoilers for the series. Since every other M. Night movie has ranged from poor to awful, I think it's safe to say at this point that The Sixth Sense was a fluke. His name on this show certainly wasn't encouraging. Seems that all of the "Is this the next Twin Peaks?" stuff was just more internet click bait hype. You’re right. Persons Unknown is a much better fit. Loved that show. It still holds an honored place on my hard drive, along with Awake and Rubicon, in a folder titled "Sadly Aborted So Soon". Also, the can’t leave town part reminded me of "Welcome To Westfield", a favorite Fringe ep. And I’m sure classic Twilight Zone did something like that back in the day. With all the homages and shout outs to other shows, Wayward Pines almost has the feel of a Bollywood movie with that genre’s typical clash of Eastern and Western styles. Secret confession: I would love to see David Lynch bring a Bollywood style show to TV. Twin Peaks weirdness plus Bollywood mishmash with a dash of Glee. Pour a stiff drink, sit back, and just imagine! Nice catch with the receptionist and Ernestine. I was trying to stuff the Twin Peaks receptionist played by the actress who later became a political loony into that scene but Ernestine is great. You mentioned the phones and other anachronisms. She was playing solitaire with an actual deck of cards. Wow. The pilot gave us all of the "what", and much of the "who", leaving only the "why" to suss out over 7 to 12 more eps. Not a choice I would have made this soon. Lets some of the air out of the mystery kinda early. Plus, now that we know more "who" than the protagonist, that puts us one level of fish bowl glass above him instead of down in there with him. Persons Unknown played that out much longer with more layers, and was better for it. Hate to admit this, but any show that gives me a character that I wanna beat the crap out of keeps me watching. And WP gave us three in the first ep. The nurse has already gone down for the 8 count, so that leaves the sheriff and that owlish glasses (Hitchcock!) "psychiatrist". May have to take up cardio boxing. Funny how a network puts its stamp of personality on a show. WP has a very FOX look and feel. Had this been an ABC show, it would have been all about Burke getting back together with his family, with at least two more dysfunctional families showing up in town already. CBS would have had the mains solve the whole thing in the pilot, form a special team, then sit down for a weekly dinner of procedural, with at least five flat screen monitors in every shot. And on NBC it would already be a horrible cluster__. With M. Night at the helm WP may go all peacock on us yet. If it does, and since I have sworn that I will NOT waste THIS summer hate watching Under The Dumb and The Strain, WP may take their place. I hope not. Like J.D. said in his comment, I would like to settle in for a nice mystery, or whatever is left of it, so I want WP to be good. And please, please, more Juliette Lewis! Her character provided the only surreal spark other than the time thing, and she’s the main reason I tuned in. I have to admit that I did stop watching after the opening. Seriously? A man in a suit opening one eye after being hurt in a vehicle related (plane, train, car) accident and hurled away? I'll admit that the review has me intrigued. Maybe I'll give it another chance. But there is no much entertainment out there (not really going to call it TV anymore) that is original, fresh and disturbing... that works to earn its place in our collective watching line ups. Someone somewhere had to know that that opening wasn't just derivative, it was almost insulting. I was intrigued by the series until I found that it was being run by Shyamalamadingdong. Why oh why does that man still have a career? Another reason I'm not enthusiastic about this show is my wife read the books a while back and told me exactly what's going on. And not only am I spoiled, but the explanation (at least as she related it) sounded mucho stupid. Hopefully it will play better on the screen than it sounded, but with M. Night in charge I'm not optimistic.